This week, I took a blow to the body when an unexpected patch of ice literally knocked me fault on my back. I apparently took a blow to the head in that slip. That first night while dreaming in vivid colour, the enemy tried to knock me out in my dreams. I arose in His strength from all those blows. That blow to my faith was a little unexpected, but it shouldn’t have been. The enemy is not a fair fighter. He likes to kick us when we are down. My God is more than a match for him. If Jesus could die, and rise from the grave victorious after confronting the enemy, if He is is with me and I am sinking into His strength vs the depressing circumstances around me, I will rise. My faith doesn’t need to waver, for the God I trust in never does. He caused my coworkers to rally around me, and i have had the best care. My family has taken extra good care of me (not that they usually don’t, but they’ve amped it to that extra special care you give someone who is unwell kind of pampering). Despite not having the head space to dive into the Word as usual, or be online like I am used to, I have a core of peace I have not quite known before. Causing my body to relax its tense muscles, my auto clock to be reset as I need more sleep than usual. As I usually have worship music on at home, He has been reminding me of His rhythm in the silence, one I never noticed before. Rest is restorative for the whole person. And I am being rebuilt somehow through this accidental fall, more wholly as He has intended. 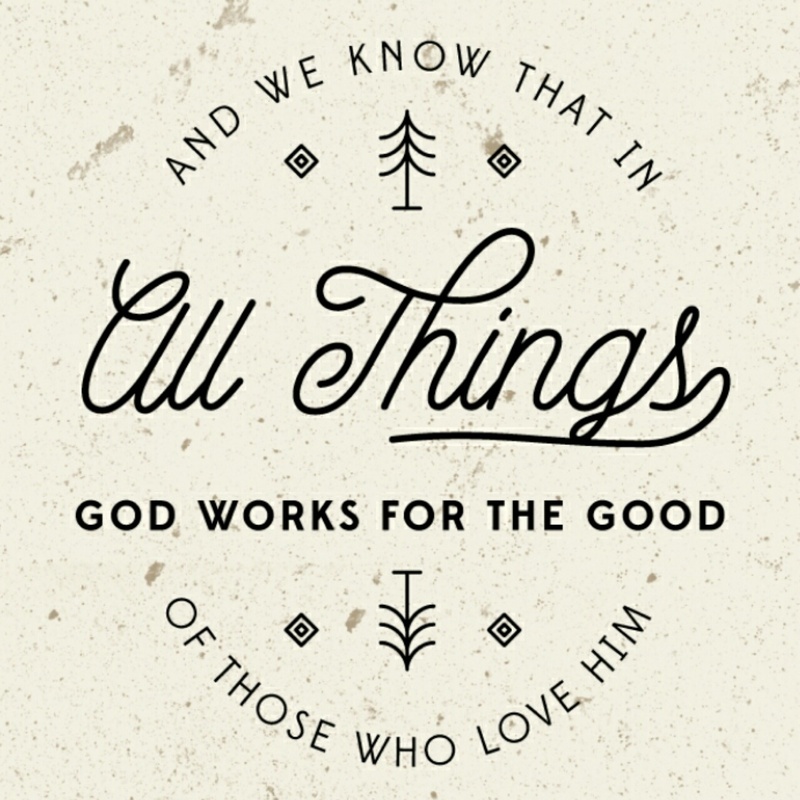 All things work together for His good. God did not cause my fall, but He is causing it to become part of the tapestry of wholeness He is constantly weaving about and within me. All things work together for those in Christ Jesus. I can rest easy, knowing this season, right now, I am to fully rest in His hands. Being able to let go of what I normally do, and allow Him to expand me beyond my normal into the beyond He has waiting for me as my trust deepens. All things work together for those who love You. Jesus, today I say it again, but I am all in. All of me, offered to all of You. Such as i am, with all my love, Jesus. And You remind me, over and over, but again today, You are always more than enough! Your mercy is new and fresh and mine. Your love for me goes on and on and on and never fades. And last but not the least for today…Your rest extends peaceful hands as You lead me by still waters. What a wonderful post, Karla, showing God’s power in our lives! Romans 8:28 is indeed my favorite Bible verse, and I love how you kept injecting that throughout this blog. I pray that God continue to heal and restore your health. It is so awesome how you see God working everything out for you! God is so good….God bless! “My faith doesn’t need to waver, for the God I trust in never does.” Karla, I love how you saw God’s hand working everything around you for your good and that you able to rest in His presence. I pray complete healing and restoration in every area of your life and thank God for all He is doing in and through you. Thank you for sharing your heat at #IntentionalTuesday. Thanks for the encouraging words Crystal! Why thanks Angela! Appreciate the kind words & your stopping by!